It’s Wednesday. I had a great visit with my neurologist this morning. It was nice to be able to tell her about all of the positive changes I’ve been making and my lack of MS symptoms. However, I did bring up my concerns with brain fog. A friend shared a really great article the other day about this, and it very eloquently listed what people with chronic illness experience. Sadly, it’s not just limited to people with MS. I am walking great, I have no fatigue, no pain (unless you count the occasional headache), and I’m overall feeling really fantastic. However, every day, throughout the days, I have issues with short term memory loss and cognitive function. I can’t tell you how many times I’ve walked up the stairs and forgotten why I was there. I will often use a wrong word or name when talking with people, and not realize it. Sometimes even, I’ll forget what I’m talking about mid-sentence. And friends and family will encourage me that this is just a normal part of aging and that they experience it too. Which is nice, and appreciated for sure, but I really don’t believe that they experience this phenomenon with the frequency I do. So I told my neurologist about this and she said it may or not be MS, but there are ways to check, starting with testing my blood to see if some of my levels are out of whack. If that’s the case, I suppose it’s a simple fix with supplements. If not, there is always the option of memory testing and exercises. I had no idea that sort of thing existed, so it gave me some hope that this is a problem that has been addressed by the medical community, and I’m not coming in with some sort of weird cognitive mystery. In other news, I slacked on laundry for one measly day and it magically piled up and threatened to take over my bedroom. I folded (and put away!) five loads of laundry today and now I would love to nap but I need to stay awake so I can answer questions for my grocery shopper, and then be up when she delivers my groceries. I LOVE grocery delivery, people. Love it. So I think I’m going to make a glass of sweet tea and read a book or do some crocheting while I wait. Something occurred to me last night. I spent all day doing stuff. Stuff needed to be done, so I just did it. Without much thinking. Do you know what that means? Yesterday I was not fatigued. Not being fatigued means I can just get up and do things and not have to wrestle with myself about it. You just get up and do it. Get this, I woke up with a pulled muscle in my neck, and it has me in such pain. I mean, searing, sharp, throbbing pains. I’m in such flippin’ agony I’ve been whining about it on Facebook all morning. If it was just one muscle, I could deal, but this thing is connected to all these other muscles, so every time I move something – an arm, a leg, whatever – I don’t know if it’s going to be okay or if it’s going to shoot fiery bolts of lightning up through my neck. It’s a crap shoot. I slept on a heating pad for most of the morning and then managed to fix myself some lunch – baked sweet potato with butter and cinnamon YUM – and now I’m chillin’ on the couch with a cup of coffee. Coffee on the right, because apparently I can’t reach from the left or the pain kills me, and then the coffee spills. We can’t have any of that happening, now can we? I went upstairs to get something and by the time I got to the top of the steps, I forgot why I was up there, so I distracted myself with laundry until it came back to me. Managed to rotate some loads, with slow and careful movements of course, and sure enough, it came to me! Drugs, I went up for the drugs. Because I can’t really deal with this pain. I normally boast a high pain tolerance, mainly because surgery and needles don’t scare me, but when it gets in the way of getting things done, that pisses me off. So I took some Aleve, and hopefully that eases a little of the pressure. If it doesn’t work, I’ll have to have the kids unload the dishwasher and take out the trash tonight. Ok, I’m sorry, but that’s all I have for now. I’ve been a little neglectful of the blog so I really just wrote this to give you something, so as not to get out of the habit of writing. More will come. It always does. Have I mentioned I don’t multi-task well? Not that anyone does, really. It’s very difficult, if not impossible, to do two things at the same time. So add in my clutz factor and you have a mess on your hands, literally. I was walking into the laundry room holding an empty laundry basket, a stack of clean towels, and a fruit smoothie. And then all of a sudden I wasn’t. Piper was quick to lend a helping tongue. I thought I had cleaned it all up, and even thought I had photographed the entire mess. I had not. 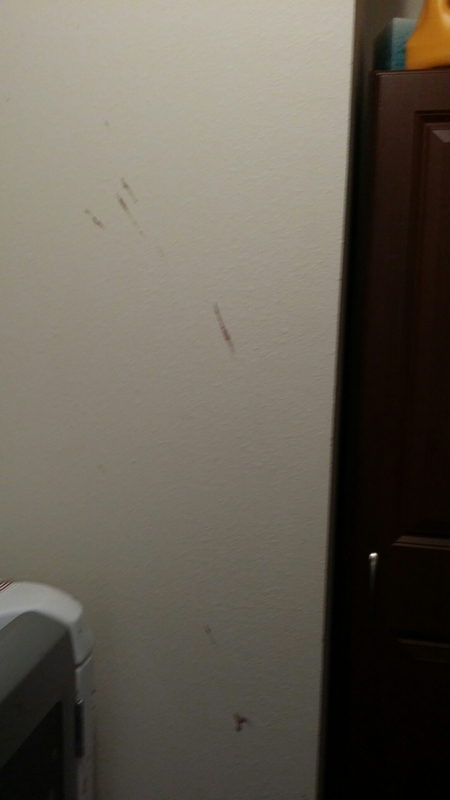 When I proceeded to work on the laundry I discovered more fruit blend not just on the dryer to the left, but above and BEHIND it. 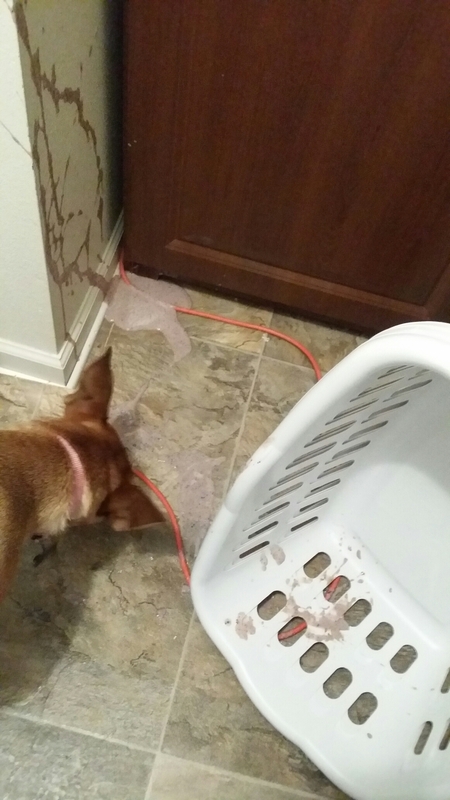 How on earth I had managed such thorough coverage of the laundry room I’ll never know, but I’m guessing I looked like a total spaz trying to save my fruit smoothie and that image alone gave me quite a chuckle. I do hope I cleaned up the last of it. I guess if I didn’t, my nose will alert me sooner or later.